For most retailers, the run up to Christmas is a very busy time, when sometimes planning and strategy fly out of the door to be replaced by ringing tills and fast and furious seasonal transacting. But approached with thought, your Christmas rush doesn’t just need to be a short sharp peak in your annual sales figures, but can be coaxed into something a lot more meaningful for your brand. In this blog post, we look at 3 simple tips to keep your Christmas rush paying throughout the year. Make your data collection process as quick and simple as possible. For ecommerce retailers, as well as collecting data during the check-out process, ensure you enable relevant pop up data capture points at key areas on your homepage and as browsing customers leave the site. For bricks and mortar retailers, investigate how you can capture email addresses along with transactional data at till point. Can you email your customers a receipt? In its simplest form, can you ask customers to leave their email addresses while the transaction is going on, with the offer of January discounts? Ensure the process is as easy as possible, so your full time staff can fit it in to the conversation at a busy till point and seasonal staff don’t feel awkward asking. If relevant for your business, reward staff for the number of email addresses and data captured to keep that data being collected. Once the Christmas rush is over and we’re in the February lull, take the time to look through the transactional data and see what sparkly Christmas treasures it holds. Existing customers – communicate your thanks, ask them if their friends and family liked their gifts, (or if they enjoyed their own Christmas treats!). Offer them a friends and family incentive for those who they bought gifts for, or a thank you offer for being such a loyal customer (to coincide with any SS17 collection, obviously…). Brand new customers – welcome them into an engagement programme, share with them your social and blog content, involve them in what you’re doing as a brand and motivate them to return to purchase. Christmas (or sale) only customers – ask them why they don’t shop with you at any other times of the year, you’re sure to find out something useful; thank them for their input and pop them on the back burner to re-invigorate at your next sale period or Christmas. For those retailers without the ability to cross reference transactional data with customer data, a simple “thank you” can often work wonders. Tell them you were grateful for their custom, that they made a difference to you and offer them an incentive to come back soon. Leapfrogg has proudly been a part of the SheerB2B conference for the past six years. As well as the bigger industry events we go to, it’s our annual opportunity to check in with the premium retail industry at the smaller, more niche, luxury end of the spectrum. We always enjoy catching up with brands and our fellow speakers over its two days of panel discussions, presentations, case studies and networking. Driving sales vs. protecting your brand was the hottest topic this year. With retail competition for the premium and luxury consumer fierce, a current retail culture for excellent service as expected and discounting the new normal, there were a number of retailers at the show all keen to share how best to keep a tight grip on their brand, whilst not losing revenue. Sarah Weedon from Jigsaw inspired us with a very generous presentation about their brand ethos and stance against discounting culture. They have a “pricing referendum” – an honest and bold statement of product quality and ‘truth’ that that brand resolutely sticks too. To ensure this ethos is lived by all departments, Jigsaw refused to participate in Black Friday discounting last year, claiming to “stand for something”; that ‘something’ being the quality of product and longevity of design. Their ecommerce team clearly communicate their sale dates to their customers at the beginning of the year and don’t discount stock below certain, pre-agreed level. 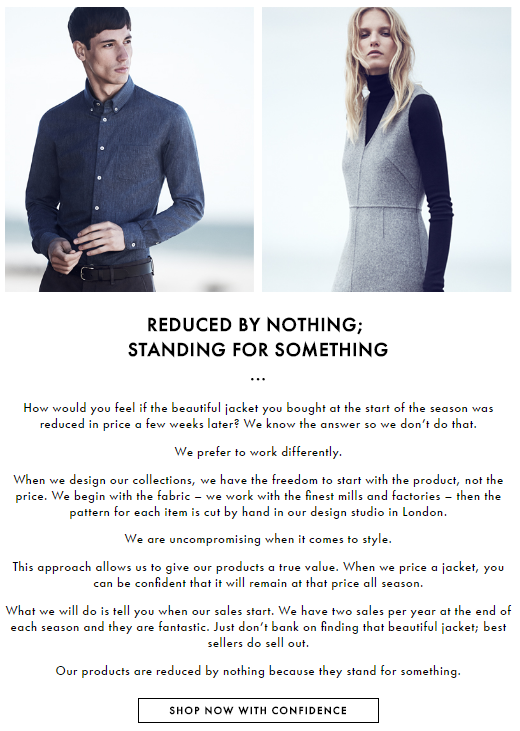 As Sarah told us, Jigsaw stocks some cardigans that can take more than 30 hours for one of their designers to hand knit – discounting something of such obvious quality is madness. Their content strategy supports the business stance justifying the price point, materials and design ethos with ongoing storytelling around quality, fostering trust and belief from their loyal audience. THE ITALIAN JOB a film by Jigsaw from Jigsaw on Vimeo. Jigsaw’s designers are also very bought into the idea of longevity and create garments of silk, cashmere and leather that can be worn season after season. Jigsaw invests in its own in-house illustrator and works closely with designers to create hand created pieces each season. There were also lessons to be learned from Martin Bartle from Arthur Ridley Esq and Michael Ross from Dynamic Action who cautioned against discounting. Many retailers know that any new customers you acquire during a discounting period, are more often than not, retained customers that feel comfortable purchasing at full price at the start of a season, but both were very clear to the delegates in the room that luxury and premium retailers just shouldn’t discount and realistically accept that revenue growth may well be slower because of it, but ultimately much better for the longevity of the brand. Martin Bartle and Michael Ross both gave presentations about digging into your data. His argument that average order value (AOV) is a myth, and it was refreshing and exciting to hear both Martin and Michael argue that retailers make a disproportionate amount of their profits from a small segment of their loyalist E.I.Ps – Exceptionally Important People – and that this segment should not only be identified but treated differently from the majority their most loyal and retained customer segment. This immediately inspired Will from our data partner rais and I, to start working on a new programme to start identifying our client’s average profile value (APV) per segment. This is an exciting element of insight that will only add value to the current segmentation, insight and strategy projects we’re working on. We have been working with retailers for many years, helping the more forward thinking ones break down their internal department silos and ensure that all internal disciplines responsible for success in digital and ecommerce communicate and work with each other better. We’ve trained offline content teams to think bigger picture about online, structured reporting procedures and lobbied for buy-in from traditional bricks and mortar stakeholders into the value of digital, but we hadn’t yet started work on breaking down logistical supplier silos. Presentations from our friends at Nosto and the logistics experts Temando, who we hadn’t met before, helped us see how the supplier chain could work more efficiently and cost effectively too. It makes sense that the customer wants a seamless experience and seeing logistics and technology suppliers talk at the conference enabled us to see how the offline jigsaw could compliment the online one. On the first day of the conference, our Managing Director, Rosie, spoke about how you can deliver a perfect personalised experience using data and insight and you can catch up with her presentation here. On the second day, I spoke about the level of customer intelligence within premium panel after analysing the results of more than 75 retailers who completed our Customer Intelligence Index. You can read a recap of my presentation here. All in all another useful conference! We’re only a few weeks into the new calendar year and I’ve already lost count of the number of conference flyers that have landed on my desk alerting me to a list of “essential” and “must attend” events for the customer experience professional this year. The sheer scale of content out there on customer experience is perplexing and many of the premium retailers we speak to don’t know where to start. However, often it’s the simplest of strategy tweaks discussed over a coffee that will start joining the dots for smaller premium retailers looking to improving their customer experience strategy. I call these learning’s ‘light bulb moments’ – they are those discoveries that seem too obvious when you vocalise them for the first time but can have a huge impact on a business. So, at a time of the year when conference organisers are asking for your company credit card and your valuable time, I thought I’d do the hard work for you and sift through opinion, trends, articles and reports to give you what we think could be the biggest ‘light bulb’ moments for premium retailers this year. Not you, not your ‘Brand Strategist’, not your Financial Director insisting on ambitious ROI and not your Head of Product Design with a thing for rose gold and copper again this season – it’s your customer that is in charge. My first light bulb moment is probably the most difficult and the hardest to implement. It’s about shifting the culture of your business away from siloed departments with exciting targets around traffic, ROI and cost-per-action to a customer-centric approach which puts the customer at the heart of what you do. Your customers are going to dictate how much you sell and when you sell it. Customers in 2015 will expect big things from you – from almost immediate customer service feedback on social media and personalised loyalty schemes – to beautiful packaging that arrives next day (free of course) and speedy returns. Start seeing your customers as your boss and their expectations of you as a catalyst for innovation, change and excellence, rather than a constant struggle with demands. By doing that you’ve already shifted your own thought processes. It’s not easy persuading everyone, but it makes decision making around strategy, product and marketing beautifully simple once done. But how do you put them first…? The truth is in the data and you already have access to everything you need right at your ecommerce fingertips. Your own transactional data is the key to unlocking the experience your customers want. When was the last time you looked at your customer database and worked out who are your most profitable or valuable segments of customers? Do you know which people in your database only buy at sale time? Which products are the gateways to customer loyalty? If someone buys at Christmas time, is it even worth remarketing to them in January? Once you’ve started to dig into your own data, you can then start asking your most important segments what experience they want from you and take a long hard look at your product strategy. Honestly, it is that simple. Well, OK, there’s some database cleaning, maths, focus groups, surveys and excel spreadsheets involved, but that only takes a couple of weeks. Once that’s all done – it feels pretty simple. Your brand is not how you define yourself to your customers, but what your customers say about you. In 2015, you need to earn your place in their hearts. Accenture found that 92% of global consumers trust seemingly unstructured content (earned media) above all other forms of advertising. So “earned media” is going to be an even bigger watch word in 2015 and all premium retailers know how important it is to be meaningful to customers. Give your customers useful, interesting, meaningful content and engage with them in the spaces they want to communicate in and they will reward you by sharing and creating content right back at you. In turn, shared and useful content kick starts any natural search, social and PR campaign, drives engagement, creates brand ambassadors and ultimately, drives sales. In order to ensure you’re building relevant retail experiences that exceed your customers’ expectations – you’ve got to ensure that those experiences are seamless. It’s been the ‘year of mobile’ for as long as I can remember and in the past five years I can also remember the year of Pinterest, Facebook advertising, wearable tech etc. The minute you take a step back from a specific channel and focus on how your experience can be communicated via that channel and indeed, if your customers even want you to be communicating with them at all via that channel – you’re thinking along the right lines. Premium retailers in particular need to fight hard to resist getting side-tracked by the latest fad. Remember what your customers want from you and enable that experience. So all your light bulbs are brightly lit; you’ve broken down those digital marketing silos, you’ve put your customer at the heart of your business, you’ve dug into your transactional data and you’re creating useful content that neatly supports your wider digital strategy. Again, it seems simple, but the best way of checking if you are genuinely delivering a decent experience for your customers is to ask them. The Net Promoter Score is going to see a revival in 2015. Here at Leapfrogg, we’re starting to talk to clients about using it as one of our central KPIs. The better you can understand how your customer sees you – and whether or not they would genuinely recommend you – the better gauge you’ll have on the future success of the business. Lots of sales are lovely, but the best customer experience strategies use the data of the past to plan for the future and what better way of checking you’re heading in the right direction than by asking your customers if they would recommend you. So how can smaller premium retailers compete with the big boys? All this database investigation, culture-shifting and content creation takes lots of budget, right? 3. You already have an intimate relationship with your most loyal customers. Several of our clients know their best customers by name and how fabulous would it be for a loyal customer to be asked to participate in the success of a business that they already love? 4. Your team has to generate PR, natural search and social content on a shoe string anyway – how much easier (and cheaper) would it be to streamline your plans to one simple content strategy that cascades across all of your channels and get your customers involved? Customer experience for smaller premium retailers. Done! Image via remographic on Flickr. 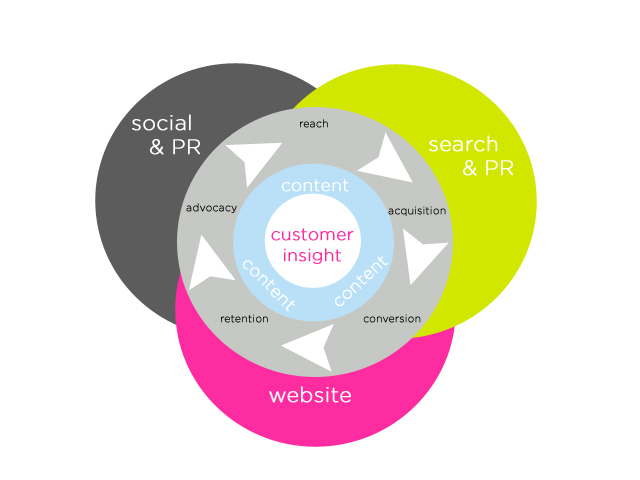 I’ve been thinking about the benefits of integrated PR and the common questions raised by clients. A range of queries such as ‘how can I leverage my offline PR activities?’ and ‘what is integrated PR?’ led me to believe that such questions deserve a blog post so marketers could also benefit from this insight. After all, if clients are questioning PR’s purpose, how many more are there? In most cases brands perceive marketing communication as separate online and offline activities, without giving much thought on how this perception can deeply affect its marketing activities. With this in mind, I wanted to raise the importance of integrating PR, so great ideas are pushed to the right consumers at the right time without overloading the balance sheet. No longer should traditional PR be seen as a separate discipline from online PR. Marketers must learn to measure and integrate traditional and non-traditional approaches as complimentary disciplines, to fully enhance their marketing communications through consistent brand messaging. Although the logic may seem obvious, this is overlooked across a variety of industries. An integrated approach to your PR activity will leverage your SEO impact on the search engine results page (SERPs) and sustain a strong brand message to your consumers both online and offline. It will facilitate a 360 degree view of your brand through carefully executed content that aligns all media messaging and brand propositions. Only a marketing agency that has a thorough understanding of your online activity and customer behaviour will understand what is actually driving your consumers. Delivering integrated PR will take into account an analysis of the client’s financial targets, business goals and online activity trends of the customer journey. Using this information means your offline marketing messages will have a better impact as your messaging will be unified as one voice, maintaining its tone and delivery on all touch points. It’s important to remember integrated PR should not just drive traffic but increase brand awareness that is consistent across all channels. The ROI in combining online and offline PR also means you have a stronger insight into measuring your campaign’s effectiveness and what is actually driving website visits or footfall. In addition, one agency overseeing your integrated PR means you can streamline online and offline activities, so you are only one phone call away from all your marketing communication needs. To be cost effective and efficient brands must embrace integrated PR and avoid separating it into two disciplines. Take for example leading luxury brand Burberry who reportedly invest 60% of their marketing budget in digital channels1 . Their innovative approaches, such as ‘click to buy’ Burberry films and ‘runway to reality’ VIP app are good examples of how to combine activity. Interestingly, Burberry announced an 8% rise in revenue – £883 million – for the first six months of 2012, followed by a 6% increase for the second half2 . Demonstrating leapfrogging competitors with innovative, integrated campaigns cuts through existing marketing ‘noise’ in the competitor landscape. So, if brands want to reap such rewards they must learn to blur the lines between online and offline PR before it’s too late. With the imminent arrival of our first baby, myself and my husband have been finally getting round to decorating the house we moved into more than a year ago. Without a car, him commuting up to London every day and me getting bigger and bigger, we have been reliant on online suppliers and home delivery services to help us source what we need, which has been a fascinating exercise for me in how different sectors approach their online customer service, delivery and post purchase engagement. At Leapfrogg, we believe that securing sales isn’t just about having a great product and a good website; it is concerned with understanding your prospects and customers at every stage of their buying journey from reach through to advocacy. There are lots of different elements of the digital marketing mix that an online brand can do to tap into their customers as they move through these different stages of this buying cycle, which I will highlight with a recent personal experience. 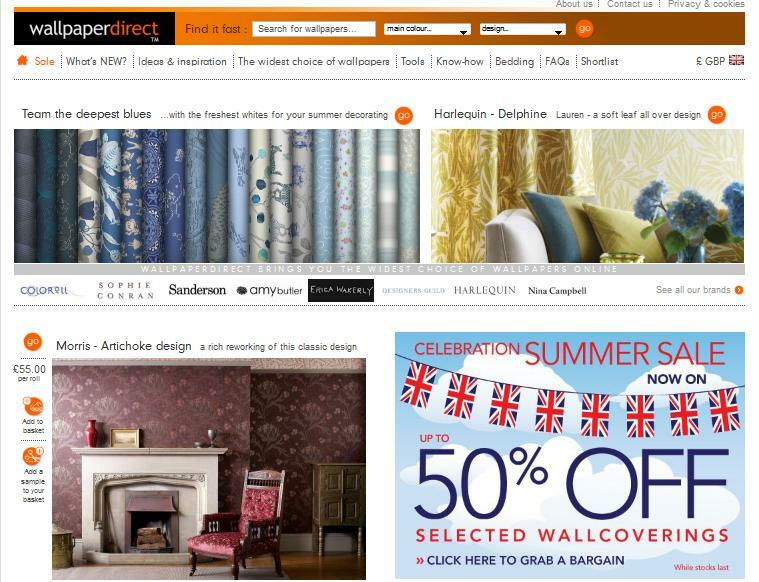 One of the most impressive online services I used to help get the house decorated is Wallpaper Direct. Not immediately a site that screams ‘premium retail’ at you, but everything about the online service they offer is slick, easy and jammed packed with added value. The first gold star I mentally awarded to them was making it easy for me to find what I was looking for. For those uninitiated, unless you’ve seen a design you really like, looking for wallpaper can be a nightmare. Wallpaper Direct enables you to search in a variety of ways: colour, brand, type of design and features of the wallpaper. While searching, you can save ones you like in a wish-list. At the end of a search, you can very easily order A4 sized samples to be sent to you. Unlike many other sites, there is no limit on the number of samples you order. You can only get a limited number for free each time, but you can order as many as you like in one go. They further impressed me when it came to ordering the correct number of rolls. I can’t lie to you, reader, I can plumb in a toilet and put up shelves, but the patience you need to match up patterns to wallpaper is beyond my capabilities – so I’ve never even tried it. Having the tool within the site to input the size of your walls / area to be wallpapered is really useful and enables you to order the right number of rolls first time. Should you require “talking down” from any wallpaper induced hysteria, they have excellent telephone support to double check you’re making the right purchases and to handle any queries or returns. The delivery service was also excellent. 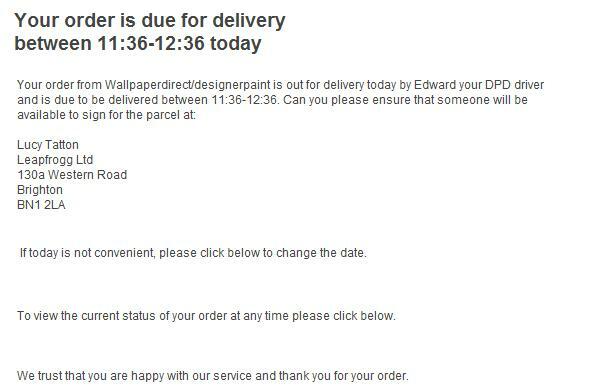 From ordering, the wallpaper arrived quickly and my expectations were managed beautifully by both emails and texts detailing the date and time of delivery and very easy steps to follow should I want to change delivery options. 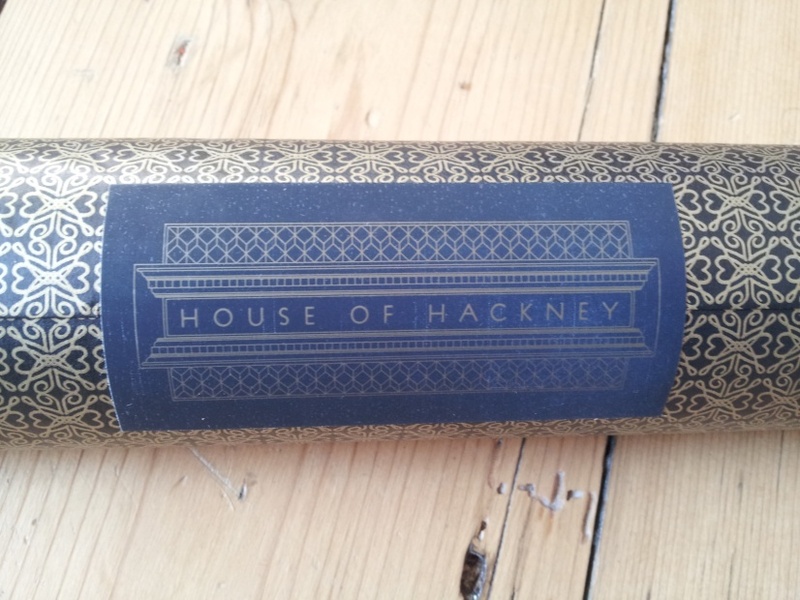 I was also thrilled with how the wallpaper arrived. It was boxed up with a handle on top of the package to enable me to carry it home easily. 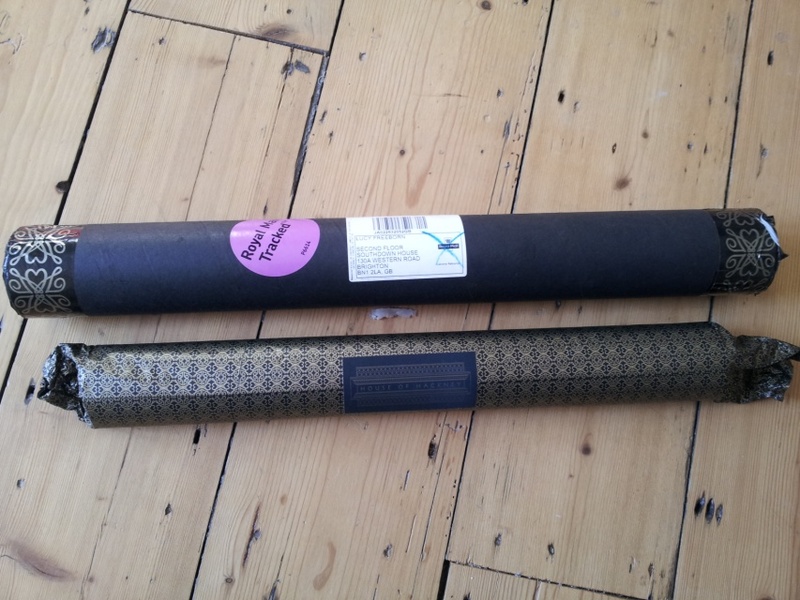 One of the brands of wallpaper I ordered was also gift wrapped with stickers and tissue paper! Wallpaper Direct may not have the brand presence of a luxury interiors brand, but if one of the hallmarks of a premium brand is an ability to understand a customer’s pain points and offer quality service and user experience, then for me, they score very highly indeed. They made what could have been a real chore, a pleasure and I would have no hesitation in using their services again and indeed recommending them to others. The brand also generates it own content to help inspire users – some thing Leapfrogg believes vital to help brand build with new customers in their ‘reach and research’ phase of the buying cycle. Producing a stand-alone and brand neutral online magazine to help customers make decisions about the products and services you sell is a great way of exposing your expertise in a field and inspire purchase. All in all, a great service that has ultimately secured the best accolade you can from a happy customer – advocacy! How well do you think you know your target audiences? Do you know why they love your brand? Do you know what makes them loyal to you? Do you know what they do in their spare time? Which of your competitors they also shop with and why? How often they hang out online, what social networks and media outlets they read? How much they are prepared to spend in one single transaction and what they think about your delivery service? At Leapfrogg, we believe that no marketing campaign can be truly effective unless you have a genuine understanding of the audiences you are targeting. This is even more important in digital marketing where you have opportunities to influence your publics ‘in the moment’ via natural, paid search and social channels. Whether it be it from a client’s ongoing work with a data research partner, our own market research projects for clients into their existing and target audiences, our ‘secret shopper’ campaigns, or regular ‘temperature checking’ of your audiences via social channels, you can only build a compelling digital marketing strategy if you understand what your target audience cares about, what compels them and what they want from a brand, product or service. Once you start developing an understanding of your customer, you can then build a compelling and strategic content plan that cascades through all your digital marketing channels, including search, on-page website content, PR activity and social media. The content workshops we run are always informed and led by insight and understanding of our clients customer personas, which means that all creatives or campaign ideas brainstormed during these sessions are already targeted at specific audiences. We’ve often found that learnings from digitally orientated research have also helped shape off-line spend. We recently undertook some research work into the digital reading habits of a client’s trade audience. Being in a position to ask a target audience what journals and newsletters that they actually read and why, has informed much sharper offline and third party partner above the line plans. Leapfrogg also conducts its own insight projects once a quarter, the most recent of which explored the habits and behaviours of consumers purchasing premium products and services. One of the most surprising pieces of insight that dropped out of our own recent research was the average income bracket of the ‘premium shopper’: £23,000 per annum. When we talked this through with our clients, it significantly broadened their own image of who their target audience was. Supported with detail around how these people shop and what online functionality compels them to buy, it is encouraging us to test search terms and try social and paid search tactics that may add huge value to digital campaigns. Customer Insight isn’t just a one off project; you can’t soak up everything you need to know about your target audiences in a single hit. As your brand evolves, as does your understanding, engagement level and conversations with your existing and developing audience and that’s one of the most exciting things about it – your customer can often move as quickly as the digital landscape in which you are operating. The ultimate objective from understanding your target audience should be to develop such a good relationship with them that they become not just repeat customers, but advocates of your brand. If spending time and a relatively small part of your marketing budget on customer insight in the beginning enables you to communicate more effectively and amplify your brand through an engaged and positive public, surely it’s an investment well spent. Last week, I presented Leapfrogg’s first piece of customer insight research of 2012 at SheerB2B, the conference specifically for retailers in the premium and luxury sector. We will be producing a piece of insight into the premium retail industry each quarter this year and our first research piece focused on exploring the habits and behaviours of consumers purchasing premium products and services. As the UK economy slides back into recession, the news agenda is packed full of doom and gloom about consumer spending on the high street and we were interested in finding out what the reality is for premium brands who sell online. Significantly, 61% of premium UK shoppers say they will not reduce their online spending habits in 2012. Great news for premium and luxury brands reading the Government’s gloomy economic report from Q1. Indeed, 30% of our survey respondents claimed they are actually planning on spending more in 2012 than they did in 2011, due to increasing levels of good service and confidence purchasing online. We also uncovered some surprising details about who the ‘premium retail customer’ actually is. The average household salary of our premium shopper respondents was just £23K per annum – really exploding the myth of who the premium retailer customer is and inspiring us to dig deeper into this in our next quarter’s research. We also looked at how the premium retail shopper uses the internet during their buying journey. More than a third of consumers use the web to compare and check prices. For 20% of respondents, online search is used for product inspiration and research. Surprisingly, only 14% use online to search for offers or vouchers, reinforcing what we’ve believed for a while, that retailers need to focus on the longer term investment in providing genuinely quality products, competitive pricing, useful information and great service over quick-win approaches such as voucher codes. There’s no doubt that voucher code sites and smart tactical pricing to help shift stock and introduce new customers to your products plays a part in a rounded multichannel approach. However, maintaining a ‘bigger picture’ focus and protecting your brand equity is key. Naturally, 39% of respondents said that lower prices would encourage them to spend more with a premium brand in 2012, but excitingly for our clients currently looking at developing better relationships with their customers, 21% of our respondents claimed that the proven quality of a product and great service is enough to encourage increased spend this year. 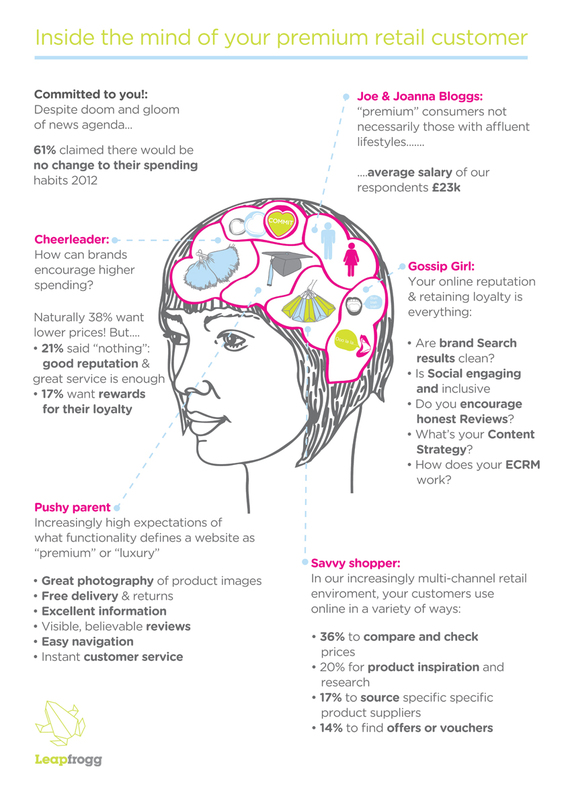 We’ve put together this infographic to bring to life the stats that we believe to be the most noteworthy from the research, but the full report, complete with advice on what to do next and actionable insights for brands, is available to download at absolutely no cost! Hotspotting allows viewers to engage directly with your video content by introducing clickable areas (hotspots) that link through to further product information or even directly to a shopping basket to purchase the item. Hotspotting delivers a two-tier benefit. Firstly, it creates a richer experience for viewers – if they see something they like in a video, one click of the mouse delivers more detailed product information, which they might otherwise have spent hours trying to track down. Secondly, the video itself, if well produced, optimised and marketed supports natural search objectives. The content has the potential to feature in ‘blended’ search results and garner all-important links. We recently hotspotted the launch video for a new luxury fragrance from Penhaligon’s called Juniper Sling. We linked two hotspotted product sections to the Juniper Sling e-commerce page on the Penhaligon’s website to ensure any coverage of the video would provide a purchase opportunity. Other uses for which hotspotting works well are catwalk show videos, lifestyle footage with product placement or bespoke hotspotted campaign videos like Cartier’s Winter Tale for Christmas last year. In hotspotting video content, we use a piece of software called LinkTo provided by Markettiers4DC. You have two upload options: using a mov video file which is hosted by the LinkTo domain (costs apply) or you can use an existing Youtube link to the video from a brand’s YouTube channel (this is a cheaper option). However, unless a brand has a paid for ‘brand channel’ on YouTube, unfortunately the final hotspotted content will not appear on the YouTube channel itself. Your video can be any duration, so long as the file size does not exceed 500MB. Once you have uploaded your video, you can also upload a preview image which will appear at the start of the video before your viewer presses play. To create the hotspots, play your video and pause it when you want to add a hotspot. The hotspot will appear on your video with white corner markers and an associated hotspot timeline will appear below the video timeline. You now resize your hotspot to cover the area you want to link and drag your hotspot timeline to where the feature (a product, for example) moves off screen. To test your hotspot is appearing and tracking correctly at any time, just play the video on this page. You can now create as many hotspots with different associated interactive landing pages as you like. You can associate the hotspot with an interactive landing page with further product information or link directly to an e-commerce page. Finally, you can choose from a range of skins for your video player and preview the final hotspotted video. Once payment is authorised, you will be supplied with embed codes for your final video. Hotspotted videos are best used for online media press kits and across a brand’s own website and marketing channels. For Penhaligon’s, we sold in the video, fragrance samples and backstory of the perfume creation to key lifestyle, cocktail and fashion blogs. The Penhaligon’s website and Facebook pages used the LinkTo generated video code for the hotspotted video. Our objective for this activity was online PR coverage and over a two week period we secured twelve mentions on our targeted blogs with an audience reach of 750,989. We achieved additional mentions in social networks reaching an additional 50,489 followers – including a Tweet by Sunday Times Style. Hotspotting works well for securing creative coverage and links but it’s still a relatively new content tactic and needs to be further tested for concrete e-commerce effectiveness. Should you open a Google+ page to aid search engine rankings? Travelmole reported recently that Google is urging travel firms to set up Google+ pages to aid their search engine rankings. According to Marketing Land this is all part of Google’s “Search Plus Your World” update (live in US, not UK yet). Numerous articles have been written on the introduction of Google+ and “Search Plus Your World” so we’ll keep things brief in terms of what it means from a user-perspective. In short, there’s a new “Personal Results” view that appears in Google searches, personalising the listings you see based on both your own behaviour and social connections. Search results combine personal signals (your search and web history) along with social signals (who you are, who you know and what you and your friends like and share). If you have a Google+ account, it will look through anything that’s been privately shared with you, to see if it matches what you’re looking for. Those results then get mixed in with web-wide matches. To see these personalised results you have to be logged into your Google account (i.e. Analytics, Gmail or Google+) otherwise it will not affect the results you see as you are searching “anonymously” (however you will still get listings down the right hand side about “People and Pages on Google+” related to your search query). It is worth noting that all search results are personalised to a degree based on your behaviour and have been for a number of years. The launch of first Google+ and now “Search Plus Your World” are extensions of this with Google seeking to make search results even more relevant based on your social connections. You can see a full, up-to-date guide to every aspect and angle of Google+ and how it impacts search on AJ Kohn’s blog. In terms of other social networks, “Search Plus Your World” doesn’t include content from Facebook, Twitter, Flickr, or any social network or place where content might be shared. As such, “Search Plus Your World” would be better described as “Search Plus Google+”, according to Search Engine Land. So ultimately, this is Google favouring its own Google+ social networking service. However, having a Google+ page does not, at the moment, directly affect your main website ranking. However, in time, if the network really takes off, a lack of a branded Google+ page and activity across the network will undoubtedly have a negative impact on how Google perceives your business. So should you be jumping on the latest social media bandwagon and setting up a Google+ profile? An important thing to consider is the demographic of the platform compared to the audience you may be aspiring to attract. According to a report by Website-Monitoring.com, two thirds of Google+ users are men, 42% are single and the most popular occupation listed is ‘student’. This goes against the popular notion that women are far more prolific users of social networks. So if your primary audience is women, you might be better building a strategy around a different social network…for now anyway. As with any social media activity we would also recommend building a strategy around content before diving in. There is no point opening a Google+ page, or any other social media channel for that matter, unless it is supported by genuinely useful and engaging content. For the moment, as an agency we’re not jumping on the Google+ bandwagon until we have carried out internal testing and have more visibility of the platform. We are advising our clients to carefully consider their objectives before they invest significant time and resource. All too often agencies push their clients to set up social media accounts ‘just because they should’ without considering the audience, content strategy to support social media activity and the time and resource to manage it. It’s early days so it will certainly be interesting to see how this plays out. Bear in mind, this wouldn’t be the first time Google have attempted to enter the social media space…with pretty disastrous results. Remember Google Buzz anyone?